All the way along Route 66 - Chicago to LA. A musical journey through 8 states and 2,400 miles, with Graham Swain. Route 66 MP3 CD covering the full length of the original 1926 Route 66. All the way from Chicago to LA goes the song - so did Graham Swain, driving down this historic American highway, Route 66, sometimes having to rediscover it. This CD chronicles Graham's whole journey down Route 66, and includes anecdotes and interviews, and is peppered with musical comment. 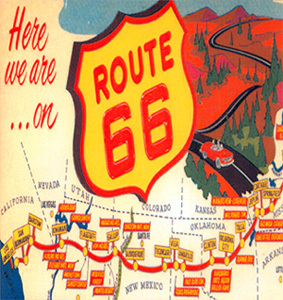 The definitive Route 66 travel guide, and compulsive listening. Load up this MP3 or pop the CD in your player, sit back, and enjoy the journey of a lifetime!! Contact Graham for your copy of Route 66. Contact Graham for your copy of the Route 66 CD. Here's something to get you daydreaming - a travelogue, covering the entire length of Route 66. Graham Swain, an accomplished journalist and broadcaster already, took a long ride down the original Route 66, from Chicago to LA. As he stopped along the way, he chatted to people who live on, or make their living from, the Mother Road. From people at diners and souvenir stalls, to the tour guide at Abraham Lincoln's house, to an old guy who has been watching the traffic pass by for decades, from the dust-bowl refugees during the depression to the present day, generations of people heading for a better life in California. He even found the gent who wrote the song 'Get your kicks on Route 66' and got him to say a few words! The interviews are generously interspersed with some classic driving tunes appropriate to wherever he happened to be.... Stopping at historical landmarks like the Wigwam Motel and Cadillac Ranch, this CD is over an hour's-worth of pure, escapist fantasy. If you plan to drive the old road, this is better than any travel brochure you're likely to find. Even if you have no chance of doing a grand American cross-country road trip of a lifetime any time soon, then stick this in the CD player on your way to work, and even the rainy Monday-morning London/ Manchester/ Edinburgh/ Cardiff/ Belfast rush-hour could be transformed into the Mother Road... if you use your imagination a little! Although you might find yourself occasionally saying 'but I already KNEW that' at the CD player, this is fantastic, wanderlust-inducing stuff. America has always been a little slow to recognise its own heritage, but now it appears that Route 66, the gateway to a better life for millions, is finally being treated as an important part of their social history, and preservation is now the name of the game. So get out there and do it, before it turns into a 2000-mile-long theme park! ....having obtained your Route66 CD and listened to it several times, we are going to do Route66 in May... usual thing, having dinner one night with friends and chatting about our travels whilst spinning our globe of the world round, where can we go next was the question, "Route 66", some one piped up, "good idea" was the answer... lots of silly chatter ensued along with the wine and I thought that's that then.... along came your CD. What an inspiration.... researched, and booked and now can't wait to get over there. Thank you.